Whether you have snow on the ground or you're lucky enough to be surrounded by palm trees, you can still have winter fun with a snowman! Try these snowman candy apples which are layered in white chocolate, snowflake sprinkles and decorated with M&M's and chocolate chips. 1) First, you take a small apple (any type of apple will work). And, place a lollipop stick in the core of the apple. 2) Cover the bottom of a plate with your Snowflake Candy sprinkles. Make sure you have enough sprinkles to roll your apples in the snowflakes and almost completely cover the apples. You'll need this plate in a couple of minutes, but, for now, just keep it to the side. Get your M&M's and chocolate chips ready too. 3) It's time to melt your white Wilton Melting Candy. First, fill a measuring cup with the melting candy to the one cup line. I followed the instructions on the Wilton package, which said to microwave the Candy Melts at 40% power (or defrost setting) for 1 minute. Stir the candy thoroughly and then continue microwaving and stirring at 30-second intervals until smooth and completely melted. *Using about 1 cup of melting candies allowed me to cover 4 small apples. 4) Then, quickly dip your apples into the melted candy. 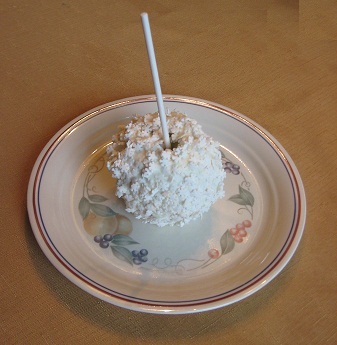 Cover the entire apple in the melted white candy (make sure you have a nice thick coating), and then immediately roll the covered apples into the snowflake candy sprinkles. 5) Use the melted candy to fasten the M&M's (for the eyes) and chocolate chips (for the mouth) onto your snowman. 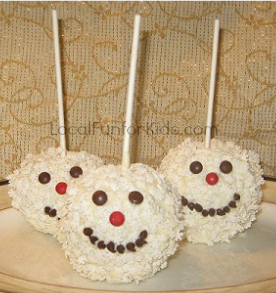 Here are three Snowman Candy Apples that we made. Aren't they so darn cute?